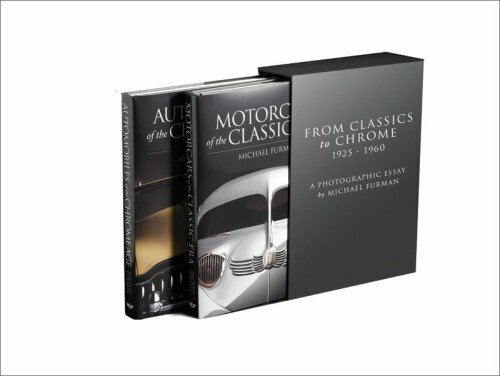 Michael Furman, the world’s preeminent photographer of classic cars, presents two of his most striking volumes together for the first time in a boxed set that will delight auto aficionados, photography buffs, and everyone who has a love affair with classic cars. Motorcars of the Classic Era captures the breathtaking beauty of coachbuilt automobiles created from 1925 through 1948, including Bugatti, Duesenberg, Cadillac, Rolls-Royce, Delahaye, Packard, and other fabled marques. Automobiles of the Chrome Age continues Furman’s photographic essay into the post–World War II era, from a hood ornament for the 1947 Nash Ambassador Suburban to the tail fins of a 1959 Cadillac Eldorado Seville. Each book features more than 150 stunning photographs and a visual index of technical information.